Here you find button badges in many different sizes and shapes. Do you want a badge with magnet, pin, butterfly lock or as a zipper pendant? 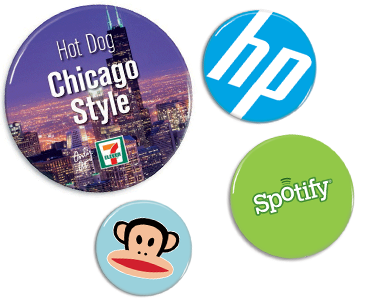 Do you want a round, square, oval or rectangular button badge? Should it fit on a jacket, a bag or for the stag party? Is it to be used as merchandise for a sports club, as advertisement for a store, or as a name tag? Only the fantasy sets the limits for the use of button badges. All our button badges are made of high quality metal and can last a very long time. OR trust in our experience as button badge designers and for a fee we can set up your button badge for you. At Badgeland you find button badges for all purposes. We are certain that we have a product that suits you! If you are unsure about something, got any questions or if you are just curious, do not hesitate to contact us at 0203 6088 008 or email us at info@badgeland.co.uk and we will answer all your questions. Our normal badges with over 20 different sizes available. Attaches with needle. Badges with clips are a good alternative to our normal needle variant. Suctioncup badges. These badges are great as a pricetag or just a fun item on a mirror.